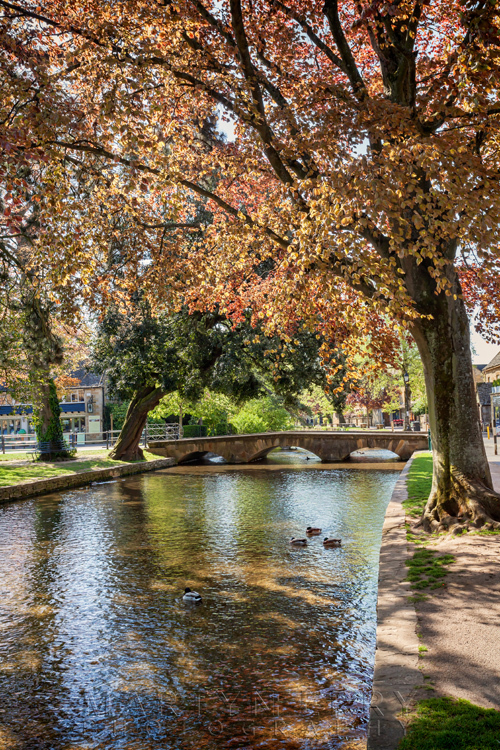 On the second day of my mini tour around the Gloucestershire Cotswolds, I found myself in the early spring sunshine on the banks of the River Windrush, as it slowly ambles through the popular Cotswold village of Bourton-on-the-Water. 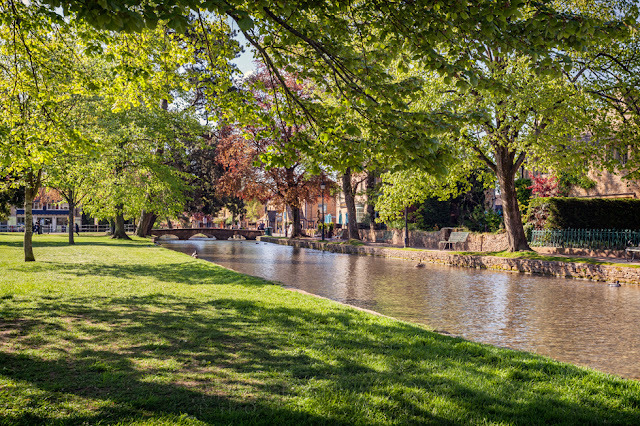 The term village of course is somewhat of a misnomer, as the number of permanent residents in Bourton outnumber those of nearby Stow-on-the-Wold and Burford, both of which are considered small market towns, despite neither of them boasting a market. It’s all very confusing. During peak tourist months, the number of visitors easily outrank residents, which, if you’ve ever visited during the summer, and seen the hordes of people lounging next to the river and milling around the shops, is not hard to believe for a second. 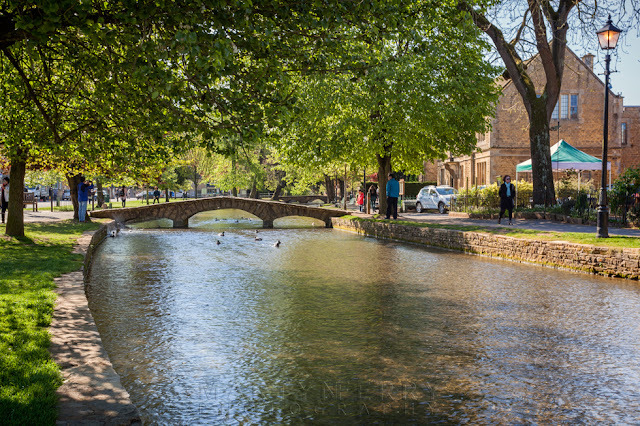 One of the reasons the place is so popular is the fact that the aforementioned River Windrush flows through the centre of the village, creating a picture perfect scene of pastoral village life, minus the faux quaint tourist shops, of which there are many, and the throngs of people of course. Plus the river is spanned by several arched stone footbridges, which have led, somewhat optimistically at best, and dementedly inaccurate at worst, to Bourton being labelled the Venice of the Cotswolds. Looks more like autumn on this tree. Anyway, we had arrived in the relatively early morning, and although there were tourists aplenty already up and about, it was peaceful enough to recollect how lovely the village can be, especially in the warm spring sunshine, and see why it’s such a draw to visitors. After getting a very decent coffee in the Cornish Bakery, with its attendant images of sunny Cornwall on the walls, and whose establishments I have only ever visited on the coast, I found myself rather bewildered, stepping back out into such classic Cotswold surroundings. 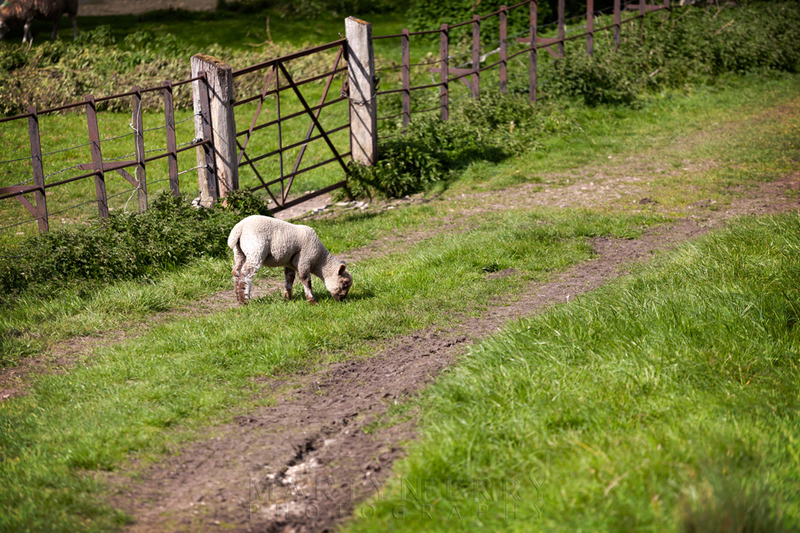 But I soon pulled myself together and we headed up the road to Lower Slaughter. Not that we were planning to stop there, having visited so many times before. 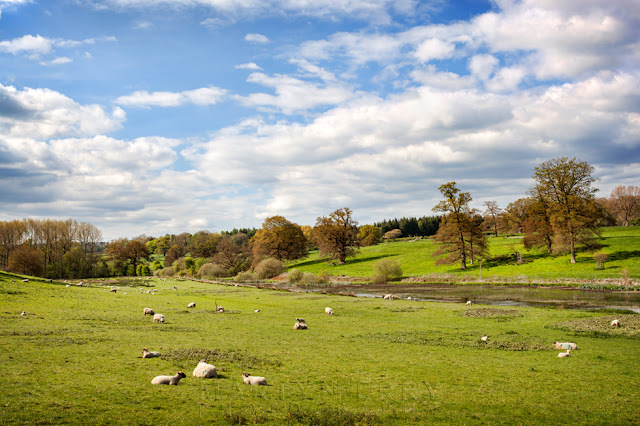 Instead we drove through the picture perfect community and made for somewhere slightly off the tourist trail, we were going to Upper Slaughter, Lower’s oft overlooked companion. While we were there some chickens were brought out to be fed by the river. Nice spot for a picnic. To my mind Upper Slaughter is about the most idyllic little village you can imagine, and I’m not sure why it doesn’t get that many visitors, perhaps because it has no actual ‘attractions’, besides the timeless beauty of it, but I’m certainly not complaining, as it leaves the bucolic charm of the place to those few that do roll up for a visit. We parked up at the southern end of the village and took a walk down to where the River Eye, a tributary of the Windrush, splits the village in two, although it doesn’t in any sense split it, as the river, although it’s more of a stream really, is so shallow that the road simply crosses right through it. There is a handsome little stone bridge that also spans it for those on foot who don’t want to get wet feet, and it was by this arched beauty that we set up the cameras to get some shots. Once that was completed, we took off again for our next destination, which was to be another overlooked little Cotswold gem, namely Eastleach. Panoramic of the village. Click on the image to see it larger. Or to be more precise, two Cotswold gems, as the village is comprised of both Eastleach Turville and Eastleach Martin, which were combined into the parish of Eastleach in 1935. 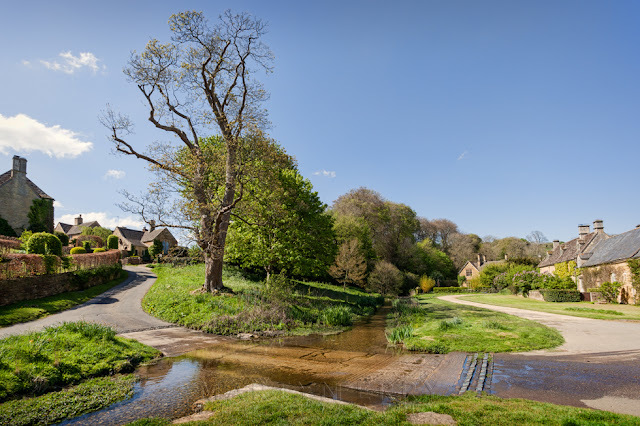 The two parts of the village are separated by the River Leach, which gives its name to the village of course. This is another place that has no attractions beyond the architecture and the sleepy rural ambience, so gets very little attention, we were the only visitors at the time. We had hoped to get a picture of St. Andrew’s church, one of two churches that sit about 100 yards apart, thanks to the historically dual nature of the village, but it was covered in scaffolding, so there wasn’t any point. This swan did have a go at a dog while we were there, but apart from that she seemed quite laid back. 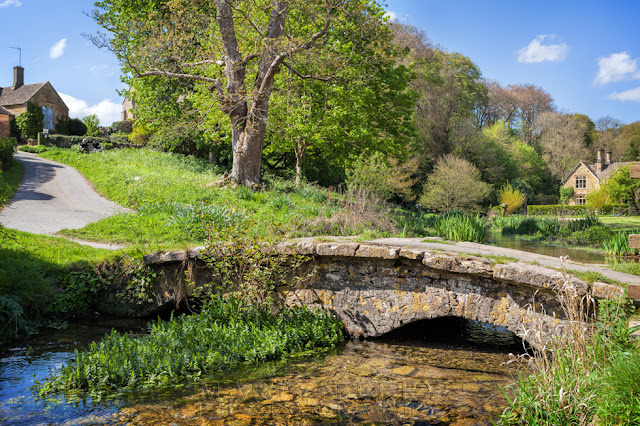 Instead we strolled over to the Medieval Keble clapper bridge, named after John Keble, the 19th century churchman who was curate of St Michael and St Martin's Church in Eastleach Martin, and who Keble College in Oxford was also named after. 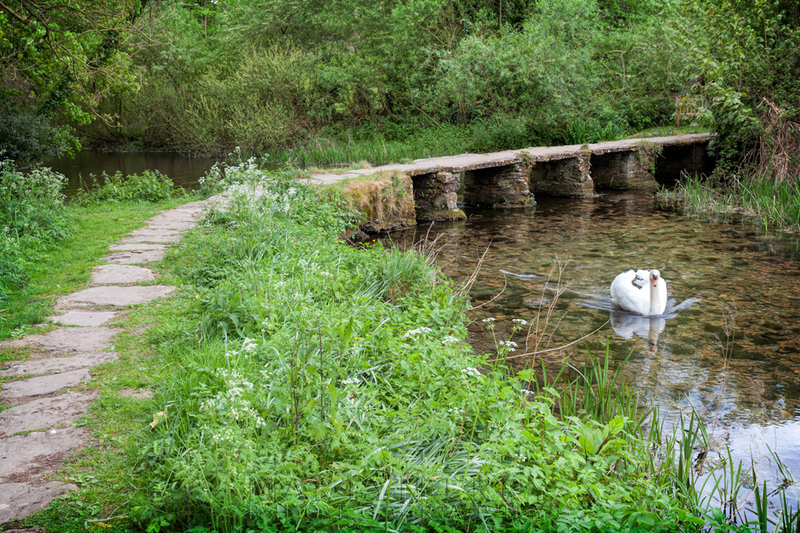 After getting a shot of the bridge, and the resident swan, who may be the most well known current denizen of the village, thanks to its overzealous defence of the bridge when she has eggs or signets to protect, we took off for a view of the Hatherop Estate. Not a typical Cotswolds view, but very nice nonetheless. 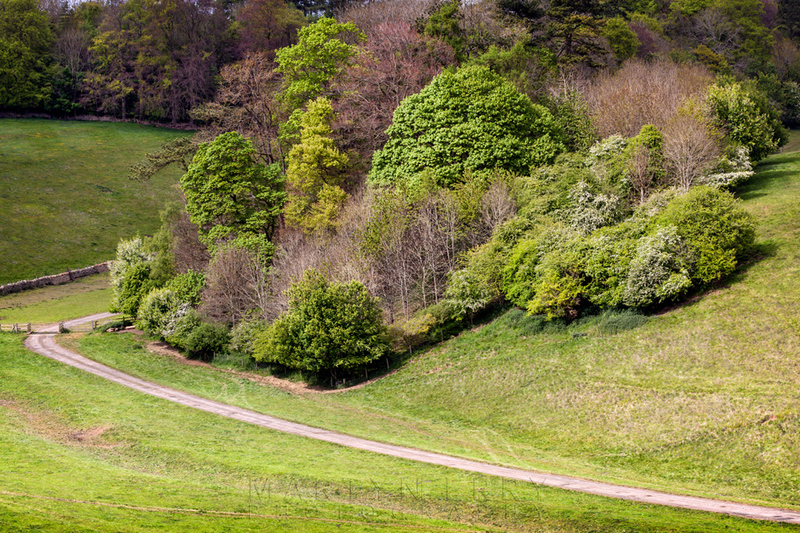 Stretching to around 3,800 acres, the estate includes several villages, including Eastleach, along with numerous farms, woodlands and naturally, a 16th century castle. No well healed estate would be complete without one. The castle is now a boarding school, and about the closest way a muggle will get to being taught at Hogwarts I know of. Close up of the barn and stone wall. 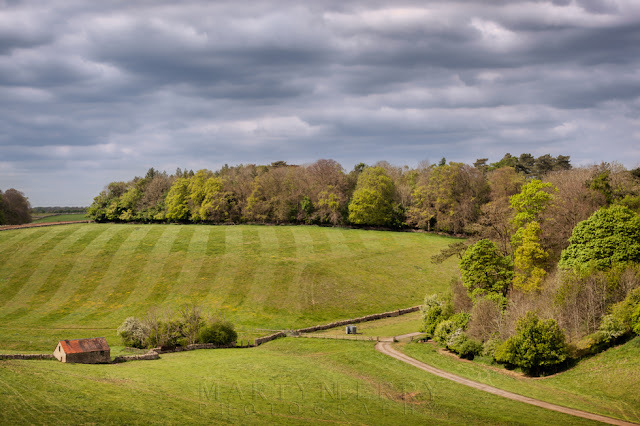 We took one of the little lanes that rises up along the edge of the estate to get a view down onto the farmland, selecting a spot that gave us a clear outlook over a single barn, a curving track, a wandering stone wall and healthy collection mature trees. The sky was still very overcast but was beginning to clear behind us, allowing glimpses of sunlight to fall upon the scenic landscape, and give it a bit of warm vitality. An attractive clump of trees if ever I saw one. 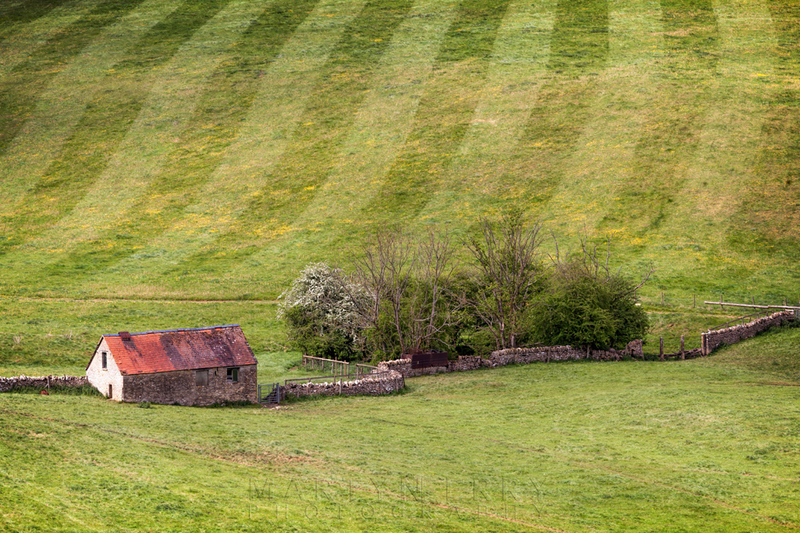 Once we had had taken a few shots it was time to wrap up the day with a trip to Sherborne, and spend a little time in the Windrush Valley. By now the weather had returned to sunshine, and we took in the beautiful scenery around us before heading to the village shop and tearoom for a bit of much needed refreshment. Looking along the Sherborne Brooke, a tributary of the River Windrush. This little fellow had escaped the confines of the field, apparently the grass was greener this side!